So you will never believe what happened to me this week. A car crashed into the back of my house! I was home with Darcy and luckily we were on the exact opposite side of the house from where it happened. The driver of the car fell asleep, hit the roundabout behind our house, went up a steep embankment, hit the fence, hit a tree, hit our AC unit, then hit the house. Dear Lord, it was scary, but everyone is safe and sound. Luckily, my kitchen was untouched! 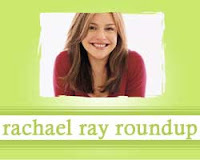 Here are some Rachael Ray posts from around the blogosphere this week. If you see a post that you think would be good for the Roundup, or you write one yourself, e-mail me (everythingrachaelray at gmail dot com) so I can be sure to include it. Teresa of Cooking with Teresa adapted Rachael's recipe for Creamy Parsley and Pistachio Fettuccine. Nellbe of Nellbe's Scribblings made Rachael Ray's Ital-Tuna Melt into a gluten free meal. The New York Times has a very interesting article about Rachael Ray's agent, Jon Rosen of the William Morris Agency. The article also makes me want to check out the Food Network's new 5 Ingredient Fix show. Has anyone seen it? The Insider debunks those Rachael Ray divorce rumors once again. No, Rachael Ray is not getting divorced! Erica of Itzy's Kitchen made Hot and Cold Sesame Noodles. Jessica of I was saying... made Moroccan Beef Patties with Couscous. Armida of Armida Cooks! made Spaghetti with Caramelized Shallots. Mare of Meet Me in the Kitchen made Asparagus with Chopped Egg and Vinaigrette. Emily of A Year on the French Diet made Halibut with Sun Dried Tomato Butter and “Potatoes” that she adapted from a recipe in Every Day with Rachael Ray. Rachael Ray attended a Food Bank for New York event in NYC. According to Media Post: "In the first quarter of 2009, Everyday With Rachael Ray -- another cable cooking show-to-magazine brand produced by Reader's Digest Association -- is down 26.3%." Uh-oh. Jessica of Weeknight Gourmet made Spinach and Ricotta with Shells from Every Day with Rachael Ray. I'm glad you and Darcy weren't injured! I hope the repair process will be speedy and smooth. Thanks for the shout out to Weeknight Gourmet. I just added you to my blogroll. Thanks!